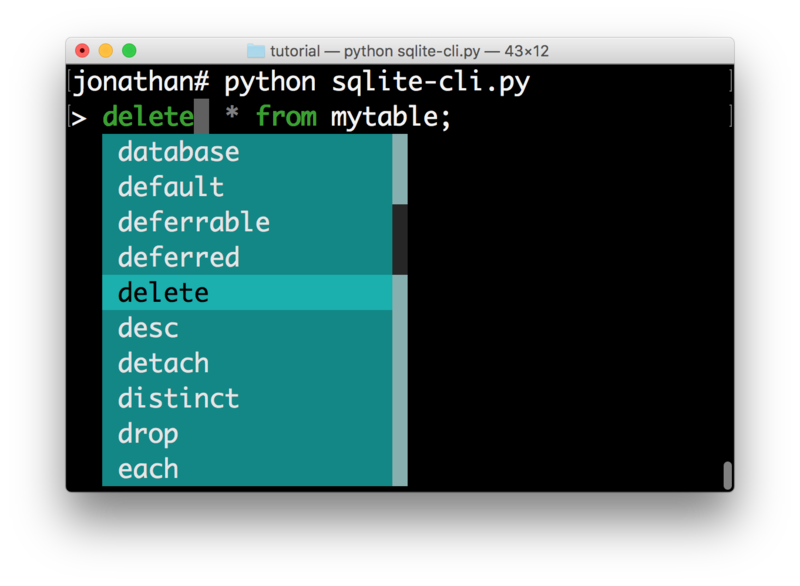 The aim of this tutorial is to build an interactive command line interface for an SQLite database using prompt_toolkit. First, install the library using pip, if you haven’t done this already. Let’s start accepting input using the prompt() function. This will ask the user for input, and echo back whatever the user typed. We wrap it in a main() function as a good practise. Now we want to call the prompt() method in a loop. In order to keep the history, the easiest way to do it is to use a PromptSession. This uses an InMemoryHistory underneath that keeps track of the history, so that if the user presses the up-arrow, he’ll see the previous entries. The prompt() method raises KeyboardInterrupt when ControlC has been pressed and EOFError when ControlD has been pressed. This is what people use for cancelling commands and exiting in a REPL. The try/except below handles these error conditions and make sure that we go to the next iteration of the loop or quit the loop respectively. This is where things get really interesting. Let’s step it up a notch by adding syntax highlighting to the user input. 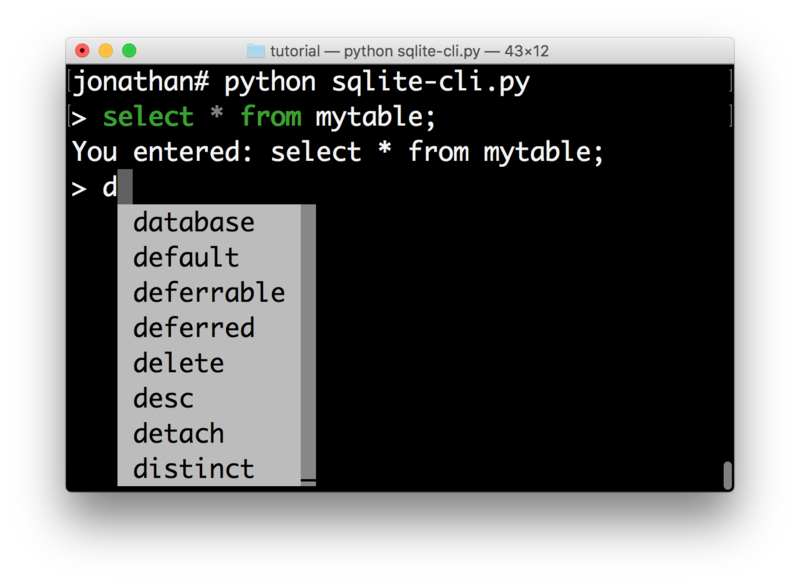 We know that users will be entering SQL statements, so we can leverage the Pygments library for coloring the input. The lexer parameter allows us to set the syntax lexer. We’re going to use the SqlLexer from the Pygments library for highlighting. Notice that in order to pass a Pygments lexer to prompt_toolkit, it needs to be wrapped into a PygmentsLexer. Now we are going to add auto completion. We’d like to display a drop down menu of possible keywords when the user starts typing. We can do this by creating an sql_completer object from the WordCompleter class, defining a set of keywords for the auto-completion. Like the lexer, this sql_completer instance can be passed to either the PromptSession class or the prompt() method. 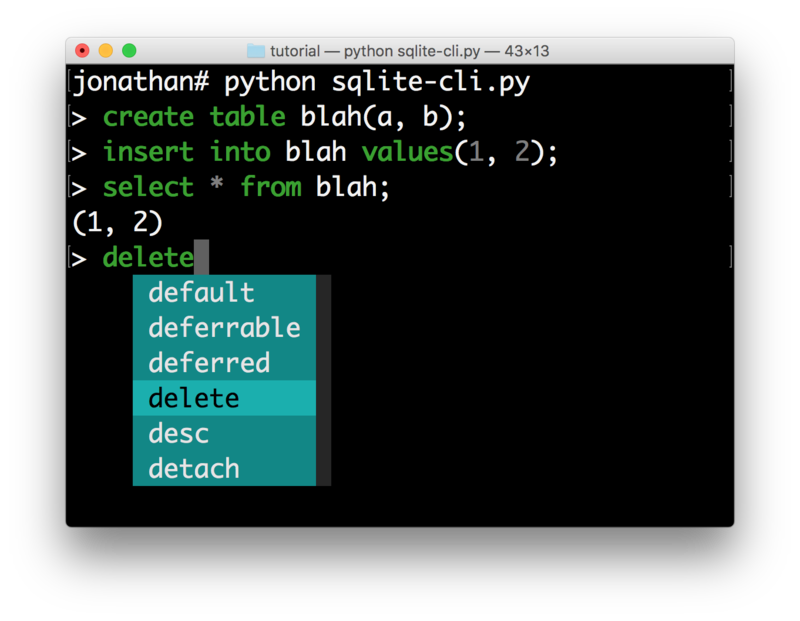 In about 30 lines of code we got ourselves an auto completing, syntax highlighting REPL. Let’s make it even better. If we want, we can now change the colors of the completion menu. This is possible by creating a Style instance and passing it to the prompt() function. 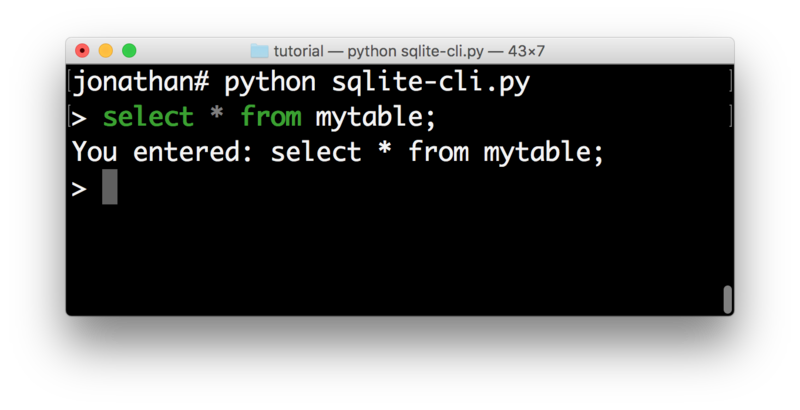 All that’s left is hooking up the sqlite backend, which is left as an exercise for the reader. Just kidding… Keep reading. 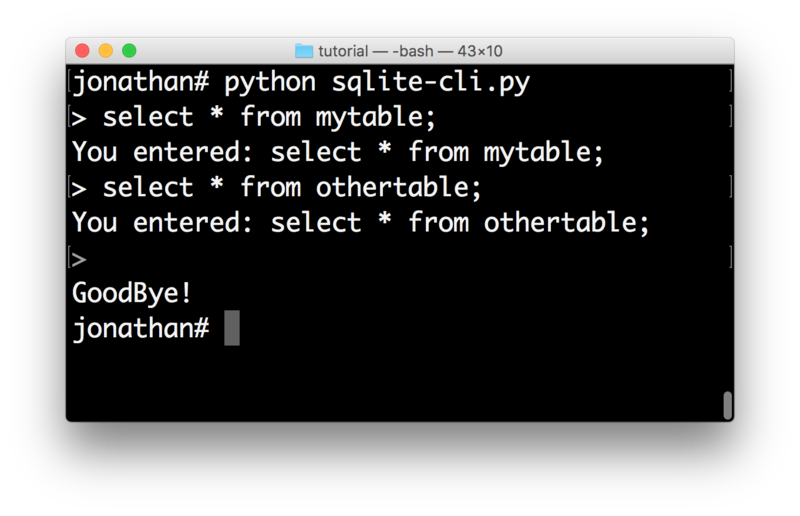 This step is the final step to make the SQLite REPL actually work. 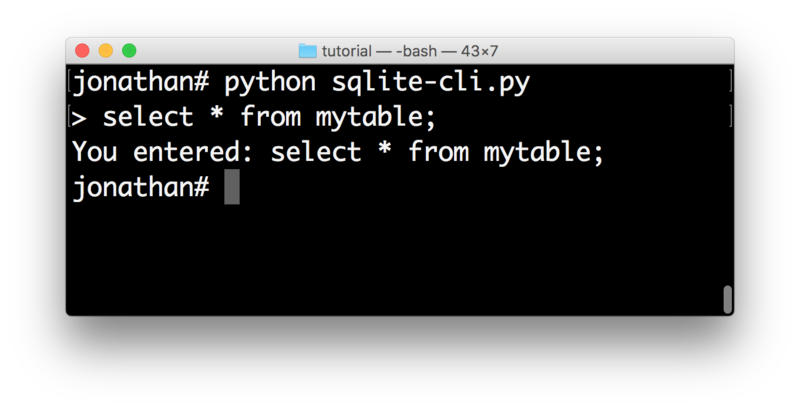 It’s time to relay the input to SQLite. Obviously I haven’t done the due diligence to deal with the errors. But it gives a good idea of how to get started. continue  # Control-C pressed. Try again. I hope that gives an idea of how to get started on building command line interfaces.